This is the Typhoon Espresso brought to you by Higher Grounds Coffee. Fair Trade and Organic certified coffees from Ethiopia, Peru, and Sumatra were combined to create this medium dark roast espresso. 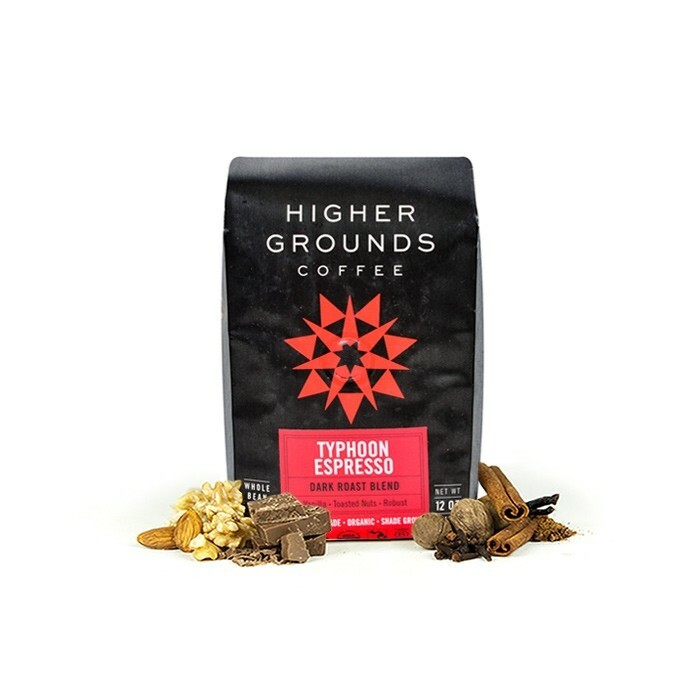 This medium roasted blend was crafted for a traditional Italian-style espresso with notes of bittersweet chocolate, vanilla, toasted nuts and a lingering roasty finish. This espresso seemed a bit bland and mild for my tastes. It was very smooth, which I liked, but to me it seemed like I could go for something bolder. Awesome, full bodied but not bitter. Exotic but still familiar, like a cross between Colombian and Kona. Loved it.